Toucan pitcher and goblets - 8" (203 mm) high. Robert Saxby was born in England and attended Croydon (London) College of Art studying Ceramics under Janice Tchalenko. He was then offered a position at the University of New Mexico Albuquerque, teaching undergraduate ceramics. He was awarded a Masters degree whilst there. In the mid 80's he became an American citizen residing in Miami, where he set up a studio and gallery. 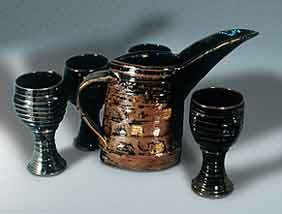 He produced mainly stoneware and porcelain specializing in copper red one off pieces, The majority being wheel thrown, altered and reduction fired. 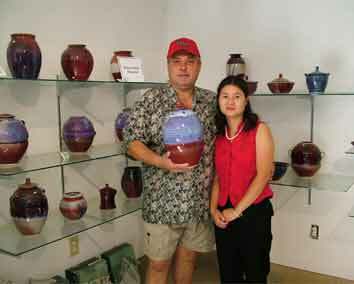 He joined the faculty of New World school, which became part of University of Florida, where he taught and lectured on Ceramics. In 1996 he wrote and produced the television series "The Art of Ceramics with Robert Saxby", which is shown on PBS and around the world. Still producing one of a kind pieces, he is in demand giving lectures and workshops both national and international, his work is held in private and public collections. Robert, while visiting Europe on business in 2003, met Xiaolan Zhuang, an educationalist who was near to completing her master's degree in England. 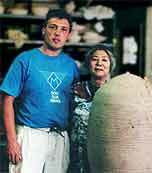 They were married in January, 2004, and she returned with him to the USA and helped him set up a new pottery at Seagrove, North Carolina. Sadly, she was killed in a road accident in January, 2007. Our love and sympathy go to Robert, a very dear friend, and we wish him strength in the difficult months to come. Our thoughts will be constantly with him.